The minivan was overdue for an air filter change on the past two oil changes, but they couldn't do the changes because in the first case they didn't have the filter in stock and in the second, the amount of time it takes to remove the "doghouse" to get at the filter was too much for all of us. So today Lisa changed the air filter herself. 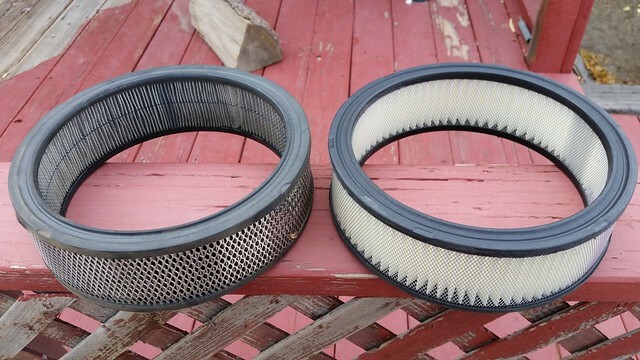 The old filter is on the left, and the new, clean one on the right. While not all of the gunk was from driving through the summer wildfires to and from Spokane, that undoubtedly had something to do with it. Lisa needed to get the doghouse off anyway because (a) I hadn't really gotten it completely latched down after the alternator replacement and (b) she was trying to figure out how to replace the rubber gasket into which the oil filler neck fits. We went to O'Reilly and they couldn't figure out any parts that would do what we needed; however, they did have another oil cap that fits, and Lisa says she can drill a hole in the cap into which the filler neck will fit, and the resulting assembly will fit into the hole in the oil pan cover. We know the oil cap will fit into that hole because when I couldn't figure out how to make the neck fit into the hole while putting the van back together after the Day of the Burning Alternator (I presumably knocked the old gasket out and didn't realize it), I put the oil cap into that hole, as shown in the picture above. GM was intelligent enough to use the same diameter for both the filler neck and for the hole in the cover itself. 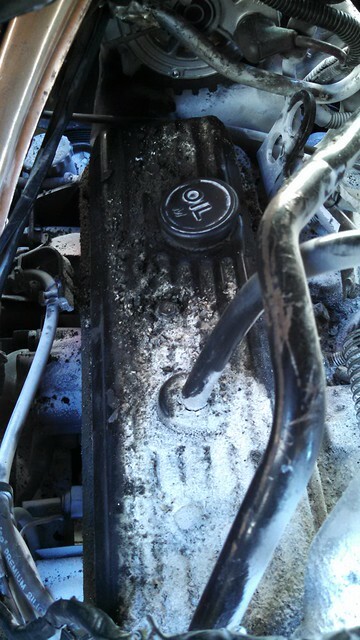 I'm glad Lisa did the air filter change. That gunky filter couldn't have been good for the van.